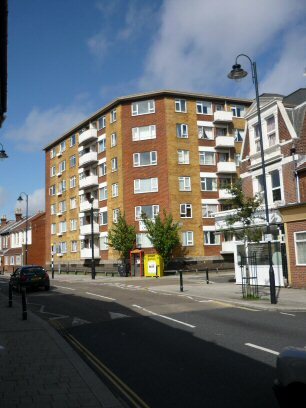 Cutting through from Bradford Junction, into Fawcett Road, and down to the corner of Bramble Road, before the first world war, we would have found the first of several picture houses which were there before the Embassy. 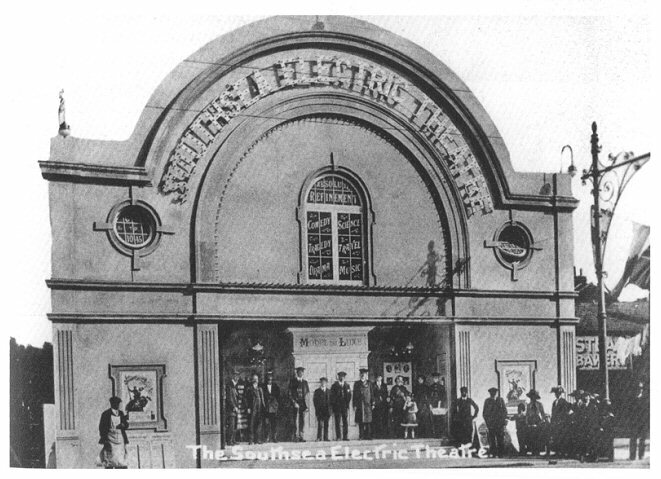 The site started life as the 'Southsea Electric Theatre' in 1911, but the name was changed several times in later years. The first film shown to the 700 strong audience was "Always a Way". Well worth the 3d. or 6d. admission charge. Patrons at the Southsea Electric did even better in the early 20s, for those buying balcony seats for 1/3d. were served cups of tea with biscuits, for free! Then followed the changes in name: the Southsea Electric became 'The Fawcett Picture House'. But it went up for auction in 1929, it fetched over �,000 and was renamed `The Capitol'. After several alterations, during which talking equipment was added, this cinema was renamed `The Commodore'. It then settled down to some happier years in the 30s; a large organ was added, and many happy sing-alongs transpired. Then in 1938 it became `The State' and this is the title more people will be familiar with. The State really opened with a bang on the 9th of July: the ceremony being performed by Sir Herbert Cayser, the Conservative M.P. for Portsmouth South. But the highlight was the first programme shown. This was dear old Will Hay in "Oh, Mister Porter", which we film buffs freely admit we could see again and again. But sorry to say the State only enjoyed another couple of years, for it was closed in 1940 to become a store. 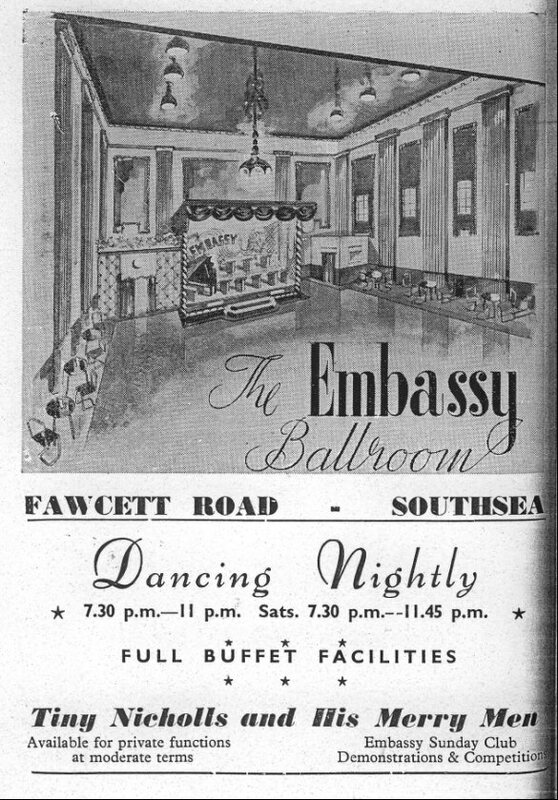 It came to life later as the Embassy Ballroom but even dancing was hit by television and that closed in 1953 and the site is now Embassy Court. Disaster struck in the January of 1929: equipment for the new talking films was in the process of being installed when a fire broke out near the projection room and machinery was destroyed to the tune of �000. December 24th Southsea's newest Ballroom, The Embassy, grand opening ball,. with Harry Roy Ragamuffins, leader Eddie Edwards with Dorothy Clinton. December 31st At the Embassy, Harry Roy and his Tiger Ragamuffins. February 17th "Go as you please" competition at the Embassy Ballroom if you can dance sing whistle or cook. April 10th At the Embassy, Harry Roy's Tiger Ragamuffins plus cabaret by the Pompeydours! April 28th Jack Lennox and the Boys, are to play every Monday at the Embassy Ballroom. May 2nd The Embassy hold a 'Lady in red' competition. May 16th final appearance of the Tiger Ragamuffins at the Embassy. May 17th Saturday, At the Embassy Harry Roy presents his New Swing Sextette, The Red Rockets, plus The Tiger Ragamuffins. May 18th at the Embassy Harry Roy presents his new swing sensation, the Red Rockets. July 1st At the Embassy Harry Roy's Red Rockets feature well known pianists Jack Lennox and Arthur Stafford and trumpeter Jack Guard. The ballroom manager is F Clark. August 18th Harry Roy's Red Rockets Sextet, with Jack Lennox and Arthur Stafford pianos, Jack Guard trumpet. September 9th At the Embassy Ballroom, Southsea's Palais de Danse, music by Jack Lennox and the Boys! October 16th The Sunday Palais Club at the Embassy has re-opened. November 16th David Channon and his correct dance tempo Orchestra plan at the Embassy ballroom. December 19th Dancing to Johnny Lyne and his sensational new Dance band at the Embassy Ballroom, also on the 20th. Dec 20 At the Embassy over the Christmas holiday Johnny Lyne and his band plus Valerio and his accordions. December 31st At The Embassy Ballroom, Billy Forrest and his Radio Band. January 1st At the Embassy Ballroom, Billy Forrest's broadcasting orchestra play for dancing. March 11th At the Embassy Ballroom, Leslie 'Jiver' Hutchinson and his All Star Orchestra. March 13th Saturday, Johnny Ashley, vocalist and compare, takes over direction of the Billy Forrest Radio Band at the Embassy Ballroom. March 27th At the Embassy, Johnny Ashley and the with Billy Forrest's radio band also Charles Cowie and the Marksmen and a �000 Hammond Organ. April 24th Saturday, Eddie Edwards and his Music appear in the evening at the Embassy Ballroom. The afternoon tea dance has Johnny Linker and his Quintette providing the music. April 26th Eddie Edwards and his Music plus the voice of Norma Picard, appear in the evening at the Embassy Ballroom. 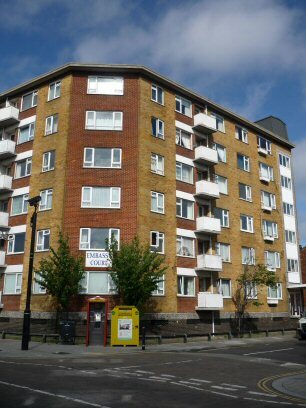 May 31st New resident band at the Embassy, Ronnie Hancox and his band. August 27th Farewell dance to Ronnie Hancox and his Band at the Embassy Ballroom. August 30th New resident band at the Embassy Ballroom, Gordon Homer, his trumpet and his Band. October 11th A new resident band at the Embassy, Benny Freedman and his Orchestra, featuring Joe "Tiny" Nicholls, 20 stones of entertainment. They are direct from three years residency at the Leas Cliff Hall, Folkestone. Gordon Homer and his Band play on Monday, Tuesday, Thursday and Friday at the Embassy until then. January 3rd Dancing to Billy Norman and his Hawaiian Orchestra at the Embassy Ballroom, for one night only. January 10th Johnny Lyne and his Music play at the Embassy Ballroom. January 26th Norma Picard, formerly with Harry Roy, sings with Benny Freedman's Band at the Embassy Ballroom. April 20th Ronnie Hancox and his band appear at the Embassy Ballroom. May 23rd Benny Freedman and his Orchestra play the final week at the Embassy Ballroom. May 30th Ronnie Hancox and his Orchestra return for the summer season to the Embassy Ballroom. August 29th Benny Freedman and his Band, including Joe 'Tiny' Nicholls, return to the Embassy Ballroom. February 10th At the Embassy ballroom, good music with the new Orchestra and Hammond Organ. February 13th At the Embassy Ballroom dancing to the Tyler trio with Hammond Organ. February 17th Dancing to Charles Tyler' Orchestra plus Hammond Organ at the Embassy Ballroom. March 15th Charles Tyler's Orchestra play for dancing at the Embassy Ballroom. March 19th Dancing to the Johnny Lyne and his Music at Embassy Ballroom. April 5th Leonard Leslie's Orchestra play at the Embassy Ballroom. April 8th Saturday, Johnny Lyne and his Music play at the Embassy Ballroom. April 22nd Saturday, Johnny Lyne and his Music and Charles Tyler's Orchestra play at the Embassy Ballroom. May 1st New resident band at the Embassy, Roy Richards and his Mayfair Music play for dancing. May 11th Leonard Leslie's Band play at the Embassy Ballroom. May 18th At the Embassy, The Mayfair Music of Roy Richards and Leonard Leslie's Band play for Dancing. May 22nd The Ted Wilcox Sextette play at the Embassy Ballroom. June 22nd Ronnie Hancox and the Dance Band for Dancers play at the Embassy Ballroom. September 2nd Saturday, New resident band at the Embassy Ballroom, Roy Richards and his Mayfair Music. October 21st Saturday, Two Bands and the Embassy, Roy Richards Music and the Nelomen. November 2nd At the Embassy Ballroom on Thursdays, a Radio Talent contest where competitors are heard but not seen. January 2nd At the Embassy Ballroom, Roy Richards Mayfair Music plays for dancing. January 23rd Embassy Ballroom band leader Roy Richards advertises for a girl singer in the Evening News. January 27th Saturday, At the Embassy, Roy Richards new girl singer is announced. February 8th At the Embassy, a meet the services Ball, with a floor show from local girl Sylvia Gusman. May 10th Ronnie Hancox and his Band play at the Embassy Ballroom. August 30th Monday to Friday at the Embassy Ballroom, Teddy Wilcox and his Music featuring the Clavioline. September 22nd Saturday, Farewell night at the Embassy Ballroom for Teddy Wilcox and his Band. September 26th New band at the Embassy Ballroom, Jimmy Luff and his Embassy Band. November 9th Jimmy Luff's Band play at the Embassy Ballroom. November 23rd Reg Bannistra's and his Music play at the Embassy Ballroom with resident Jimmy Luff Band. 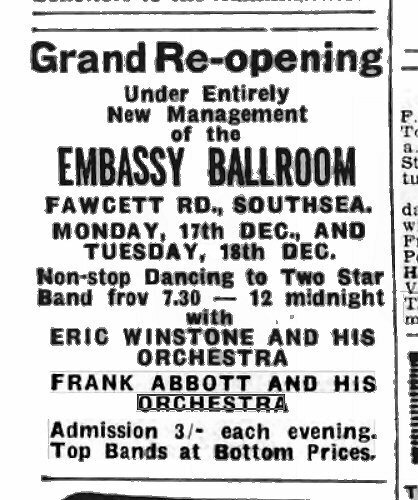 December 17th The Embassy Ballroom, under entirely new management, re-opens after redecoration, with two new bands, Eric Winstone and is Orchestra and Frank Abbott and his Orchestra. December 20th New resident band, Frank Abbott and his Broadcasting Orchestra, featuring vocalist Walter Russell, play at the Embassy Ballroom. January 31st Ralph Sharon and his Orchestra play at the Embassy Ballroom. February 13th A renewed publican's license is granted for the Embassy Ballroom despite objections from several public houses, particularly the Royal Exchange situated opposite. February 15th Leonard Leslie and his Old Time Dance Orchestra play at the Embassy Ballroom. February 28th Leonard Leslie and his old Time Dance Orchestra play at the Embassy Ballroom. February 29th Leonard Leslie and his Orchestra play at the Embassy Ballroom. March 7th Leonard Leslie and his Orchestra play at the Embassy Ballroom. March 14th Leonard Leslie and his Orchestra play at the Embassy Ballroom. March 21st Leonard Leslie and his Orchestra play at the Embassy Ballroom. April 4th Leonard Leslie and his Old Time Orchestra play at The Embassy Ballroom. May 3rd Saturday, The Leonard Leslie Orchestra play at the Embassy Ballroom. May 16th Leonard Leslie and his Orchestra play at the Embassy Ballroom. May 23rd Leonard Leslie and his Orchestra play at the Embassy Ballroom. May 30th Leonard Leslie's Orchestra play at the Embassy Ballroom. June 27th Leonard Leslie's Orchestra play at the Embassy Ballroom. October 31st The farewell night for Frank Abbotts Orchestra at the embassy Ballroom. November 1st Saturday, Drummer Gene Mayo and his ten piece Orchestra begin their residency and play at the Embassy Ballroom, he is a former England schoolboy football international and has played cricket for Kent Colts. His Orchestra includes The Oyam Dixielanders' and the 'Martin Davis Bop Group'. February 9th Tito Burns and his Band play at the Embassy Ballroom alongside gene Mayo and his Orchestra. February 16th The David Ede Quintet, play at the Embassy Ballroom. February 23rd Leslie Baker and his Orchestra play at the Embassy Ballroom. March 2nd The Squadronaires, directed by Ronnie Aldrich, play at the Embassy Ballroom. March 9th Vic Lewis and his Band play at the Embassy Ballroom. March 16th Ken Mackintosh and his Broadcasting Orchestra play at the Embassy Ballroom. March 23rd Jack Parnell and his Music makers play at the Embassy Ballroom. March 30th Oscar Rabin and his Orchestra play at the Embassy Ballroom. April 1st Johnny Lyne and his Orchestra play at the Embassy Ballroom. April 6th Billy Ternent and his Orchestra play at the Embassy Ballroom. April 13th Leslie 'Jiver' Hutchinson and his 'all coloured band', play at the Embassy Ballroom. 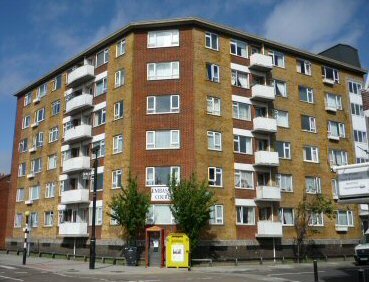 April 20th The Johnny Dankworth Seven and Cleo Laine play at the Embassy Ballroom. April 27th Saturday, The Squadronaires play at the Embassy Ballroom. May 4th Gene Mayo and his Orchestra, play at the Embassy Ballroom. May 11th Jack Parnell and his Music Makers play at the Embassy Ballroom. May 25th Vic Lewis and his Broadcasting Band play at the Embassy Ballroom. June 2nd Dancing to Grace Cole and her All Girl Orchestra at the Embassy Ballroom supported by Gene Mayo and his Orchestra. June 8th At the Embassy Ballroom, the Tito Burns Sextet play for dancing. June 29th Carl Barriteau and his Music play at the Embassy Ballroom. 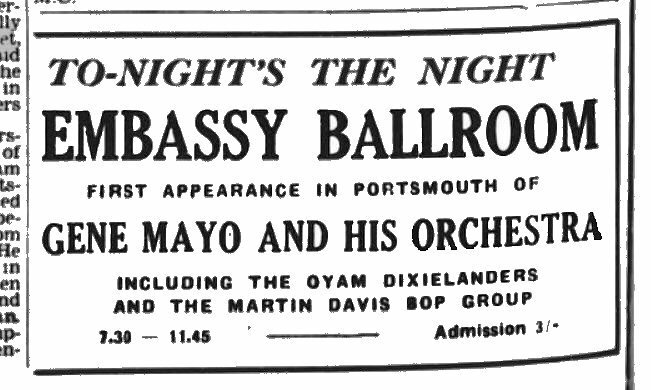 September 14th The Gene Mayo Band moves from the Embassy Ballroom to become the new resident band at the Empress Ballroom at North End. September 23rd Bebopping to David Francis and his Orchestra at the Embassy Ballroom. October 3rd Farewell night for David Francis and his Orchestra at the Embassy Ballroom. October 5th Joe 'Tiny' Nicholls and his Merry Men begin a residency at the Embassy Ballroom. September 24th Small ad in the Evening News, The embassy ballroom available as a store and freehold for sale with Percy Collett and Son. On the opposiote corner, the white painted shop, was the Co-op during the 1940's and 1950's, so quite like there was a bakery a the rear. In the photo at the top, a bakery appears on the far right. One could assume this cinema was facing Fawcett Road.